Above: The Atlantis XII waits with a tender at the dive site in Cozumel, Mexico. Below: The hatch leading to the passenger compartment on the submarine. 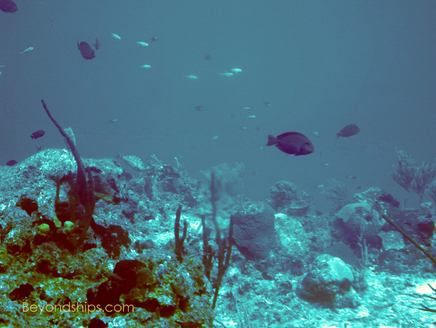 The submarine maneuvered amongst the coral heads. In the 19th Century, Jules Verne caught the public imagination with the idea of exploring the undersea world via submarine. The concept of viewing an ever-changing aquatic world from an underwater vehicle has continued to intrigue writers, filmmakers and the general public ever since. However, except for scientific submersibles and small industrial craft, submarines with windows have been pretty much confined to theme parks. In 1986, this changed when the Atlantis I entered service as a passenger submarine in the Caribbean. It was the brain child of Dennis Hurd, who had a background in submersibles used in connection with offshore oil drilling. Today, his company, Atlantis Submarines International, operates 11 submarines in 11 locations in the Caribbean and in the Pacific. 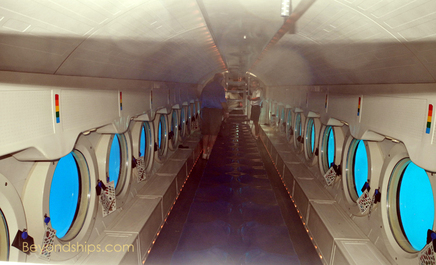 Not surprisingly, an adventure on an Atlantis submarine is a popular shore excursion during cruises to the Caribbean. 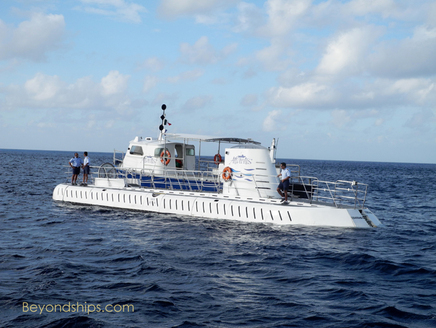 There are Atlantis subs in Aruba, Barbados, Cozumel, Grand Cayman and St. Martin. 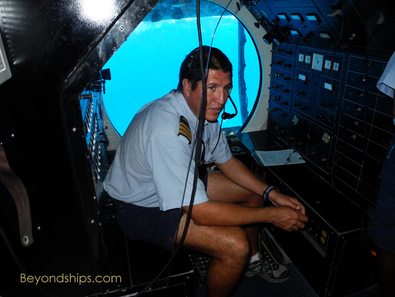 During a port call in Cozumel, I decided to experience a dive on one of the Atlantis subs. 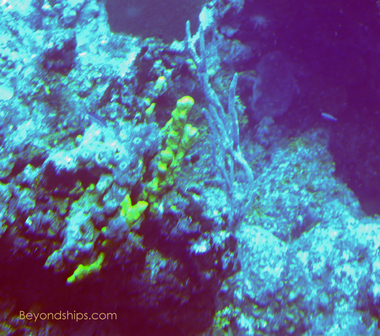 Beyond just looking for a bit of romantic adventure, Cozumel is known for its clear waters and extensive reefs and so it seemed like an ideal place to experience this attraction. I booked the excursion through the ship’s tour office. The price was more expensive than the prices posted on Atlantis‘ website http://www.atlantissubmarines.travel/eng/rates.cfm However, Cozumel is a busy port and with several cruise ships calling there that day, I did not want to take the risk of being closed out if I tried to book independently. In order to get to the submarine, we boarded a large tender at the cruise port not far from where our ship was docked. 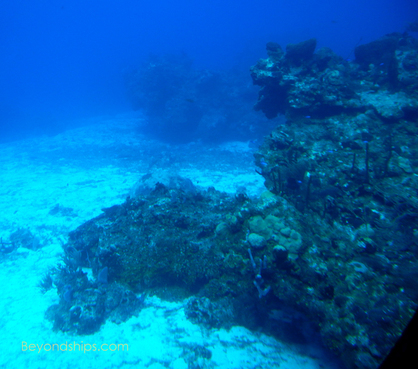 It took us on a 15 minute ride along the coast of the island to Chankanaab, an environmentally-protected marine sanctuary, where we boarded the submarine. On the way to the submarine, one of the Atlantis employees described the safety procedures both for the tender ride and for our time on the submarine. He noted that the submarine that we would be traveling on had done thousands of dives without an accident. The submarine was waiting for us offshore. We pulled along side of the sub, which was attached to another tender on the opposite side. A gate in our tender’s railing opened and we crossed over onto the deck of the submarine. Although the vessels were out in open waters, none of the passengers had difficulty with the transfer. Once aboard, the passengers went through a hatch and descended a ladder down into the hull of the submarine. The ladder was similar to those used in military submarines but not as long. The cruise ship had advised us that guests had to be capable of descending and climbing a 12 step ladder in order to take this tour. 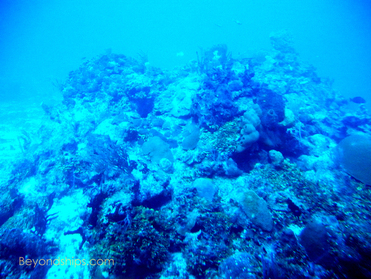 Atlantis XII, our vessel for this dive, is about 65 feet long and 13 feet wide. It can accommodate 48 passengers. She is powered by electric batteries and is reportedly capable of 2.5 knots underwater. The interior is air-conditioned and pressure controlled and thus is a comfortable environment. The only time that you could feel the motion of the sea was when the submarine was on the surface. Once it dove beneath the waves, there was no pitching or rolling, only a gradual descent that was much less pronounced than on an airliner. In this regard, the experience was different than the experience in a semi-submersible. The semi-submersibles that I have been on were essentially boats where the passengers sit in the hull of a relatively deep draft boat and look out windows in the hull that are below the waterline. Because the boat remains on the surface throughout the voyage, it is subject to the motion of the ocean the entire time. 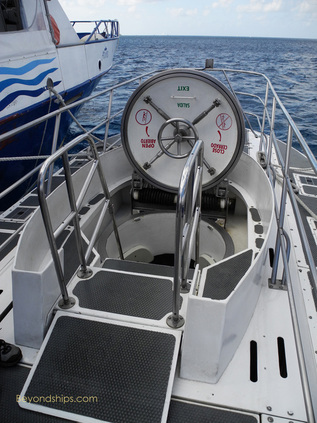 Of course, with a semi-submersible, the open air is always just a few feet away up the boat’s ladder. This can be comforting to those who are subject to claustrophobia. However, although one of the people on my tour did voice a concern before boarding the submarine, no one appeared to be having any problem once the submarine was underwater. Perhaps the large windows on either side of the submarine ease concern over confinement. Perhaps it is just the excitement of the voyage.